Canvas is a popular choice for printing large giclée Giclée, pronounced "zhee-clay," is the use of the ink-jet printing process for making fine art large format digital images. The term is used to describe any high-resolution, large-format ink-jet printer output with pigment-based inks. photos and reproductions of works of art. 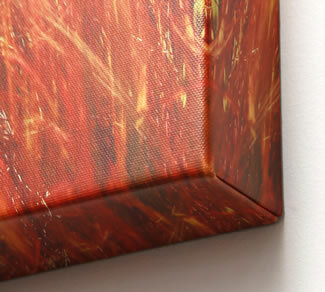 Canvas has a coarser texture and is more durable than our other paper choices. When photos are printed on canvas you may lose some detail when viewed up close, but when you stand back, the texture provides a wonderful painting-like quality to the photograph. We use Lyve Canvas, an archival cotton/polyester artist canvas made especially for the giclée printing process provided by Breathing Color. The method most used for oil paintings is to stretch the canvas over a wood frame. The canvas is secured on the back with staples. A potential problem is that acid from the wood in contact with the print around the edges will shorten the life of the print. Also, humidity and air-born contaminants can reach the print on the back side causing wrinkles and color shifts. Another problem is that the pigment making up the image may crack when it bends around the edge of the wood frame. We have solved some of these problems with our Gallery Wrap Kit. This is a great choice for large prints up to 40x80 inches.